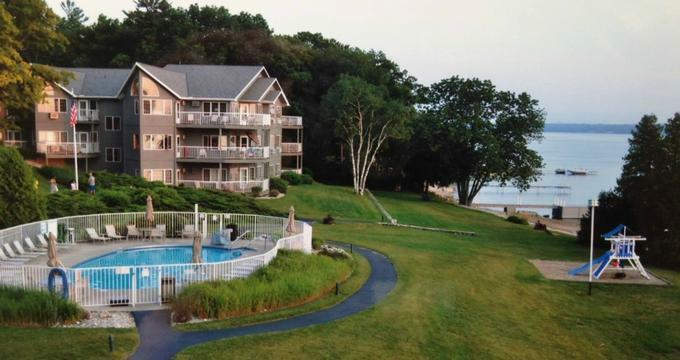 Located a few miles from downtown Sturgeon Bay overlooking the tranquil waters of the bay, Bay Shore Inn is an award-winning property that offers a relaxing, waterfront retreat. Established in 1922 as a seasonal waterfront resort, Bay Shore Inn was turned into a family-friendly resort in 1991 that provides comfortable accommodations with breathtaking views of the bay towards Potawatomi State Park. The resort features a variety of accommodations from spacious one and two-bedroom water view suites to a three-bedroom cottage for families, all of which are stylishly decorated, have fully equipped kitchens, living and dining room areas and are equipped with all the amenities needed for a hassle-free vacation. The Inn offers an array of amenities, facilities and recreational activities for guests to enjoy, including a private sandy beach, complimentary bicycles, paddle boats, rowboats, and kayaks, indoor and outdoor heated swimming pools, a fully equipped fitness center, and an on-site massage therapist. Bay Shore Inn is situated two-and-a-half miles from downtown Sturgeon Bay, where there are plenty of restaurants, bars, cafés and shops to explore. Bay Shore Inn features a variety of accommodations from spacious one and two-bedroom water view suites to a three-bedroom cottage for families. All accommodations have king or queen-size beds dressed in deluxe linens and comforters and plush pillows, en-suite bathrooms with walk-in showers, single vanities, thick towels and branded bath products, and fully equipped kitchenettes with fridges, microwaves, and coffeemakers. In-room conveniences include flat-screen televisions, telephones, and complimentary high-speed wireless Internet access. One-Bedroom Suites are 712 square feet in size and feature king-size beds dressed in deluxe linens and comforters and plush pillows and en-suite bathrooms with walk-in showers, whirlpool tubs, single vanities, thick towels and branded bath products. One-Bedroom Suites have comfortable living rooms with queen-size sleeper sofas, dining areas with tables and chairs, fully equipped kitchens with fridges, microwaves, and coffeemakers, and private decks with beautiful water views. Two-Bedroom Suites are 1,000 square feet in size and offer king-size beds dressed in deluxe linens and comforters and plush pillows and en-suite bathrooms with walk-in showers, whirlpool tubs, single vanities, thick towels and branded bath products. Two-Bedroom Suites have comfortable living rooms with queen-size sleeper sofas, dining areas with tables and chairs, fully equipped kitchens with fridges, microwaves, and coffeemakers, and private decks with beautiful water views. Deluxe Two-Bedroom Suites are 1,455 square feet in size and offer two king-size beds dressed in deluxe linens and comforters and plush pillows and two en-suite bathrooms with walk-in showers, whirlpool tubs, single vanities, thick towels and branded bath products. Deluxe Two-Bedroom Suites have comfortable living rooms with queen-size sleeper sofas, dining areas with tables and chairs for six guests, fully equipped kitchens with fridges, microwaves, and coffeemakers, and private decks with beautiful water views. Supreme Two-Bedroom Suites are 1,415 square feet in size and offer two king-size beds dressed in deluxe linens and comforters and plush pillows and two en-suite bathrooms with walk-in showers, whirlpool tubs, single vanities, thick towels and branded bath products. Supreme Two-Bedroom Suites have comfortable living rooms with queen-size sleeper sofas, dining areas with tables and chairs for six guests, fully equipped kitchens with fridges, microwaves, and coffeemakers, and private decks with beautiful water views. Premiere Two-Bedroom Suites are 1,645 square feet in size and offer two king-size beds dressed in deluxe linens and comforters and plush pillows and two en-suite bathrooms with walk-in showers, whirlpool tubs, single vanities, thick towels and branded bath products. Premiere Two-Bedroom Suites have comfortable living rooms with queen-size sleeper sofas, dining areas with tables and chairs for six guests, fully equipped kitchens with fridges, microwaves, and coffeemakers, and private decks with beautiful water views. The Three Bedroom Cottage is 1,600 square feet in size and offers two bedrooms with king-size beds dressed in deluxe linens and comforters and plush pillows and a third bedroom with twin beds a queen sleeper sofa. Two en-suite bathrooms have walk-in showers, whirlpool tubs, single vanities, thick towels and branded bath products and a spacious dining room has a six-seater dining table and chairs, a fully equipped kitchen with fridges, microwaves, and coffeemakers, and a large private deck with an outdoor barbecue grill and beautiful water views. Deluxe amenities, facilities, and guest services at the Bay Shore Inn include a private sandy beach and newly renovated dock and extended pier, complimentary bicycles, paddle boats, rowboats, and kayaks (available from Memorial Day to Labor Day), a fully equipped fitness center, and basketball courts. There is also a newly renovated sports court type surface where games such as tennis, pickleball, and shuffleboard can be played, a video games room for rainy days, an outdoor playground and picnic areas with gas barbecue grills, and indoor and outdoor heated swimming pools with a whirlpool. Other amenities include a campfire pit next to the beach area for relaxing under the stars, guest laundry facilities, an on-site massage therapist, and waterfront group and conference facilities for special events and functions. There is complimentary high-speed wireless Internet throughout the property. The resort’s conference rooms cater for a variety of corporate events from meetings to team-building functions, and conference facilities are available for groups of 5 to 60. The Waterview Conference Room can be configured in several ways, depending on the needs of the function, and can accommodate up to 50 guests in a classroom style, or 60 guests in a theater or banquet style. The conference room is fully equipped with a variety of audio-visual equipment, including a television and VCR player, a flip chart, paper and markers, and a projection screen.